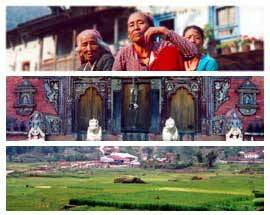 Nepal pictures gallery: landscapes photos, people and religious icons. Although it is not that easy to take pictures during a trek, on a bike or while rafting, we did our best to make this Nepal travelogue. Before going to Nepal we knew the landscapes were gorgeous but what touched us is the friendliness of nepali people, always ready to assist someone they don't even know. This Nepal trek was our first approach hence we decided not to rub elbows with the highest summits. That's why we stayed in the Kathmandu valley and prefered a multisport stay (climbing, riding and rafting). Besides Kathmandu, we visited Bakhtapur and Patan cities. The main tourist curiosity is the religious aspect with the most unusual for us Pashupatinath, the big hindouist sanctuary near Kathmandu. This is where bodies are cremated on funeral pyres overhanging Bagmati river where ashes are easily spread out. Nepal photos is part of travel photos website.